Winter Park, FL On Wednesday, September 13th Orange County Public Library will host the Margarita Engle and Mike Curato at the Chickasaw Public Library branch. 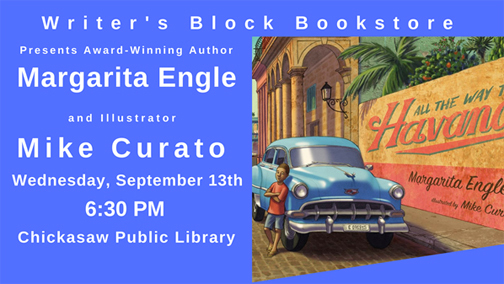 (https://www.ocls.info/locations-hours/chickasaw-branch) Start your Hispanic Heritage Month celebration early as Cuban-American author, Margarita Engle, and illustrator, Mike Curato, invite us to travel with them and explore their new picture book, All the Way to Havana. All ages are welcome. About the book: Showcasing the colorful buildings and iconic classic cars of Havana, this verse picture book follows a Cuban boy and his family on their road trip into the city. So we purr, cara cara, and we glide, taka taka, and we zoom, zoom, ZOOM! A family drives into the city of Havana to celebrate a cousin's first birthday. Before their journey, the boy helps his papa tune up their old car, Cara Cara, which has been in their family for many years. They drive along the sea wall, along the coast, past other colorful old cars. The sounds of the city are rich—the putt putts and honks and bumpety bumps of other cars chorus through the streets. A rich celebration of the culture of the Cuban people, their resourcefulness and innovative spirit, and their joy.